The Executive Business Club comprises an exclusive group AmCham Board of Directors and Patron Member companies. The major purpose of its meetings is to create a top-level speaking and networking forum for corporate leaders enabling them to discuss key business issues, exchange high level intimate ideas and share insights in a relaxed and constructive atmosphere. The AmCham Executive Business Club is an added member benefit for the top level of membership, which already have and deserve more benefits, just as in any club with various levels of membership. 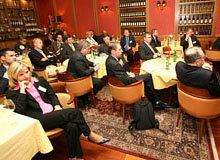 The AmCham Executive Business Clubs are open only for AmCham Board and Patron membership companies.